Not being a Bellingham native, I had no idea what the clue “her angel eyes are haunted” meant during a scavenger hunt I particpated in last weekend. Apparently, if I had grown up here, I would have known that local kids paint the eyes of this Bayview Cemetery angel to glow in the dark around Halloween. After losing the scavenger hunt challenge by 10 seconds (thanks to a soiled shoe and some deer), I decided to revisit Bayview for a proper picture. I discovered that a cemetery is fertile ground for strange things that have absolutely nothing to do with the paranormal. 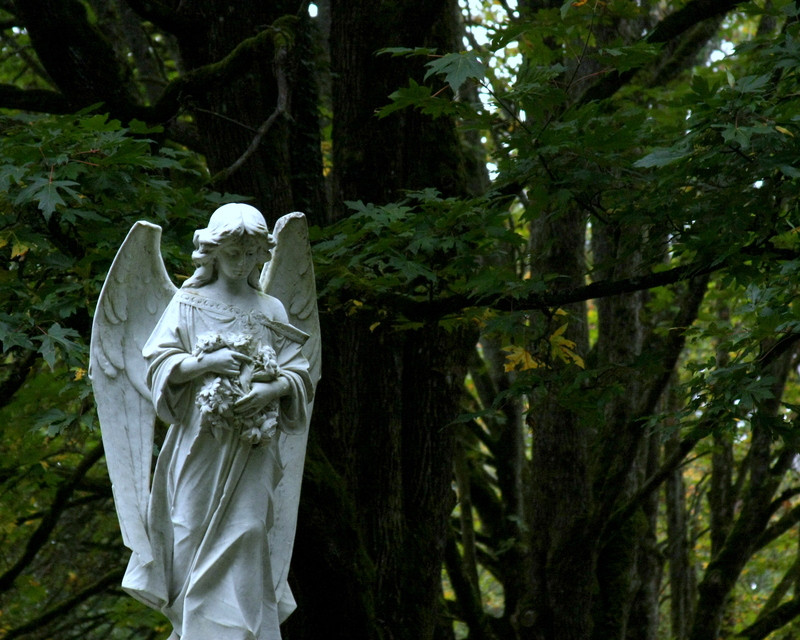 While photographing the angel, a young man approached me to ask if the angel statue was new to the cemetery. I told him what I was doing and then he yelled at some kids who were making out upon a large gravestone. When I turned again to continue the conversation, the man had disappeared, and the kids were running the other way. There were a few lurkers there as well, and coupled with the general eeriness of an unnaturally high humidity, I made it a short visit. Yes, it does bring to mind “Midnight in the Garden of Good and Evil” which is a very good thing. I’ve always found cemeteries and cemetery imagery to be evocative and thought provoking. Beautiful shot. I like this. I know you know why!